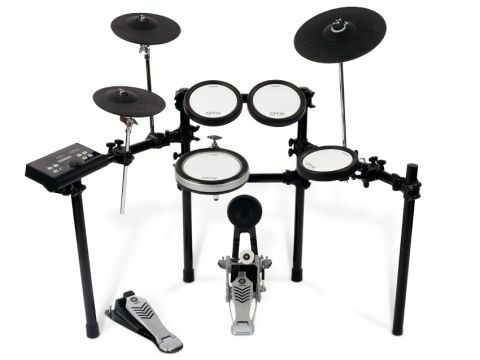 The 540K continues to uphold Yamaha's increasing reputation as a serious electronic drum brand. A perfectly convincing, well-priced and supremely likeable kit. Does feel like a practice kit at times. The last time a Yamaha DTX set-up graced these pages it was the mid-range DTX700 that was making a strong impression. "The DTX500 module impresses, with a very decent selection of chunky, bright and, importantly, dynamic sounds from the off." The 500 range kits are built around Yamaha's DTX500 module, and the DTX540K rig sits firmly in the middle of the company's offering. It's the least expensive of the range to feature all DTX-PADs as opposed to the TP rubber pads that appear on the cheaper 500K and 520K options. Spend more on the 560K and you get a 'real' hi-hat trigger rather than the 540K's simple pedal/pad. The line-up offers options to suit various wallets, but the 540K strikes a sound balance between price and features. The RS500 rack on which the kit's pads are mounted is pretty much the epitome of simple-but-effective. It's relatively compact (a boon for spare bedroom set-ups), without feeling too cramped, and the use of curved steel bars adds not only a little extra space but a nicely 'designed' air to the kit. Yamaha hardware is always top notch, so as you'd expect the whole thing goes together beautifully, with clamps and cymbal stands that allow decent flexibility of positioning. Our admiration for Yamaha's Textured Cellular Silicone pads is well known, so it's great to see them employed for each of the 540K's drums. But before we get too carried away, we should point out that the XP70s used for the toms are only 7" in diameter (the XP80 snare pad adds an extra inch). They're not exactly tiddlers, but Yamaha doesn't go as far as spoiling us with 10" XP100s or anything. You'd hardly expect the company to at this price, but it's worth pointing out that the smaller pads do imbue the 540K with more of 'practice kit' vibe than might otherwise be the case. Seeing as that's the likely application for the majority of 540Ks, it's no biggie. While we're on the subject of pads, the DTX540K's cymbals are chokeable three-zone types that facilitate access to edge, bow and bell tones. The hi-hat and crash are PCY100 10" pads, while Yamaha spoils us with a 13" PCY135 ride - that extra three inches makes a real difference to playability, so it's a welcome addition. As mentioned above, the 540K's price doesn't allow for the real/virtual hi-hat set-up of its bigger brothers, instead harnessing the PCY100 pad to a trigger pedal. Of course it doesn't feel a whole lot like a cymbal mounted on a regular hi-hat stand, but it is surprisingly responsive. Also scoring highly in the feel-good stakes is Yamaha's KP65 kick pad, which is solid and minimises wobble well for a free-standing unit. And so to the DTX500 brain itself. As with all electronics, even relatively modest units like this have come on in leaps and bounds in the last decade. The 500 features 427 drum and percussion voices, 50 preset kits, a 16,000 note sequencer, 19 reverb types, two-band Master EQ and some really well thought-out training functions. The Measure Break, Groove Check and Rhythm Gate keep your timekeeping honest in a variety of entertaining ways (muting your strokes if they're not in time, for example) and make woodshedding rather more interesting than it otherwise might be. It'll come as no surprise to regular readers that the DTX540K's pad feel won us over immediately, as we'd expected with the use of TCS playing surfaces for all drums. The well-judged blend of firm-but-giving response is as good as always - you just need to make sure you're accurate with the smaller 7" pads. But that's no bad thing where a kit that's likely to be used largely for practice is concerned. The DTX500 module also impresses, with a very decent selection of chunky, bright and, importantly, dynamic sounds from the off. Some of Yamaha's own acoustic kits appear in recreated electronic form here, and for the most part they're very playable indeed - the company really has worked hard on its 'out of the box' electronic drum sounds in the last few years. The presence of the rhythm training features reflects the DTX540K's likely status as chop-building kit as much as anything and they're both useful and entertaining (if frustrating). But increasingly, even affordable kits like this are seen less as standalone 'it is what it is' propositions - the ability to trigger external sound sources over MIDI, add extra pads and so on means that long-term usability is guaranteed, with the basic kit able to grow and morph as needs change.